One of the better known medicinal herbs Comfrey (Symphytum officinale) is reputed to be one of the most useful plants in permaculture as well. So good for the body and good for the soil. Other varieties are also available including the White Comprey, Symphytum orientale. This is a leafy herbaceous perennial that grows well in cool to temperate climates where it will flower and self seed and it is dormant in winter. It grows in sub tropical areas it will grow year round but struggles to flower or set seeds. Large leaves covered in fine hairs and pale purple flowers in spring Comfrey is used as a forage plant but more widely to help condition the soil. Its leaves are added to compost or dug back into the soil, its long taproot penetrate the heaviest soils and will help to break down heavy soils. In permaculture the foliage is cut 3 – 4 times a year with leaves composted, used a ‘dig in’ green compost or soaked in water to make a liquid fertilizer. You can buy comfrey seeds, however it is much easier to buy small plants as tubestock. Comfrey will grow well in most soils and prefers full sun to part shade. Plants can be grown from seed sown in spring or from offsets and self sown seedlings. If left to self seed it can become a bit of a problem, it does not often set them and is easily dead headed . However it is easily controlled and is most useful in the garden. Use for adding to compost, or do dig in as a soil conditioner. Cut leaves and use them as a mulch. Used as a liquid fertilizer after soaking leaves in water for a few weeks. As we said, Comfrey has been used as one of the stalwart plants for permacutlure for many years. It is said to have a number of benefits in soil improvement, many of which seem to be verifiable. 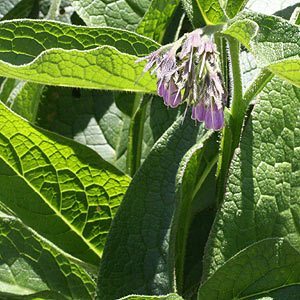 Comfrey is also used to make tea as well as ointments and creams.